Alert Disaster RestorationWhat Does A Fire Actually Do To Your Home? What Does A Fire Actually Do To Your Home? A fire can have devastating effects on your home. Any and all possible preventative measures should be used to avoid a fire in your home. There are three major ways that a fire will damage your home. Those are smoke damage, soot deposits in the home and throughout the air, and lasting structural damage brought on by burning and melting caused by the fire. Below are detailed explanations of how each of these three consequences of fire damage affects your home. 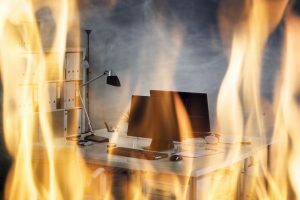 If you ever find yourself suffering from any or all of these hazards from a fire, don’t hesitate to contact the pros at Alert Disaster Restoration in the Bakersfield area for all your fire damage cleanup needs. A fire doesn’t have to burn down your hone to be incredibly destructive. Smoke damage is one of the most prevalent concerns that victims of fire damage should have. The smoke from a fire will quickly spread throughout your home. If there is enough of it, it can damage and scar parts of your home and some of your belongings. Even if the smoke doesn’t cause visible damage, the smoke smell can embed itself in your carpet, furniture, blankets, possessions, and so on. This smell is sometimes possible to remove but not always. Of all the danger a fire poses after it is out, soot is probably the biggest one. Soot is composed of burnt microscopic particles. These particles are incredibly dangerous to inhale and can even be carcinogenic. You should take absolute care in your home after a fire so you can avoid inhaling any soot particles floating in the air. If you must go in your home soon after a fire you should, at the very least, wear a surgical mask and only remain inside for as short a time as possible. Ideally, you should call a professional cleaning and restoration company to come and in and inspect your home immediately after a fire to determine how safe it is to go inside. This is the most obvious and visible effect that a fire has on a home. The most intense fires have the potential to completely burn down a home. They completely destroy the foundational integrity of the home. In these cases, this damage is very visible. However, fires oftentimes cause such damage but only to a degree that is dangerous yet not clearly visible. This is another reason why it is critical that you have your home inspected by professionals after a fire. They will be able to determine if your safe is safe to reenter of if you are in danger of it collapsing and causing serious, or even, fatal injuries. Hopefully, you avoid ever encountering any of these issues in your home. By taking preventative measures against fires, you can avoid almost all of such fire occurrences. Looking for tips on how to prevent house fires? Check out our fire prevention blog. However, mistakes do happen and freak accidents will always be a threat. Once again, Alert Disaster Restoration is qualified and experienced in responding to all types of fire damage cleanup emergencies.